The Pennsylvania Star Wars Collecting Society (PSWCS.org) has announced their latest charity coin that will be available in their booth #1342 at Star Wars Celebration Chicago. This coin will feature Commander Wolfe and the proceeds from this coin will go to the Wolf Sanctuary of PA. It will cost $10 per coin and will be a limited edition run of 1,000 coins. If there are any coins left over from Celebration they will be made available for the same $10 plus shipping. This is another great coin in a line that has featured many great coins and the proceeds are going to another great charity. Below is more details about the coin and the charity. PSWCS.org, in conjunction with the Pennsylvania Star Wars Collecting Society (PSWCS), is excited to announce their newest charity medallion going on sale for the first time at Celebration Chicago to raise funds for the Wolf Sanctuary of PA.
Wolf Sanctuary of PA, based deep in Pennsylvania Dutch country, is a 501(c)(3) non-profit organization that provides food, shelter, and veterinary care for over 40 wolves and wolf dogs, with no government or corporate assistance. The limited-edition medallion is fully approved by Lucasfilm and has an edition size of 1000 pieces. 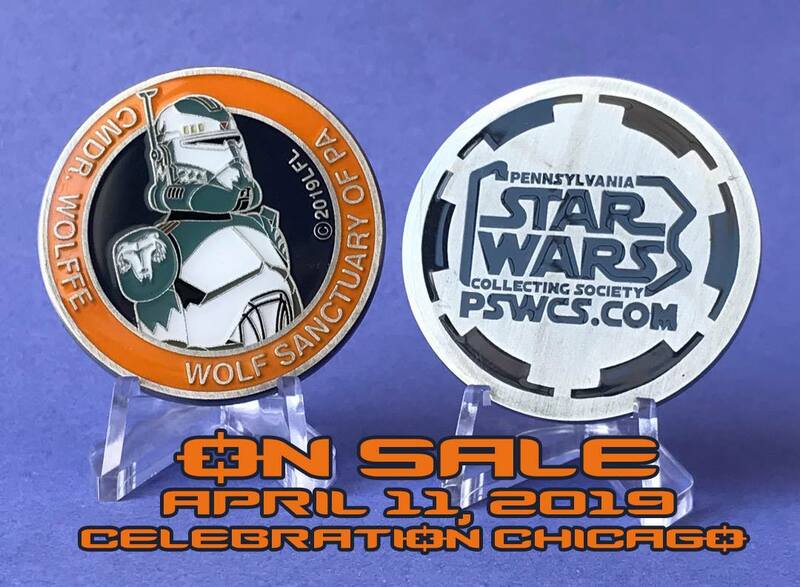 Each medallion features the likeness of Clone Commander Wolffe on the front, along with the date and the name of the charity, Wolf Sanctuary of PA. The back features the PSWCS logo. The medallions will be $10 each and will be accompanied by a Certificate of Authenticity and receipt as they are tax deductible. The medallion can be found during Celebration Chicago at the PSWCS booth #1342. If any medallions remain at the end of Celebration, they’ll be available online for $10 plus shipping.